Click here for direct link to audio Episode #7. 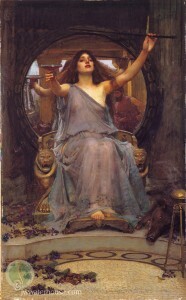 Circe the Sorceress….another painting by J.W.Waterhouse. It turns out that Jason & Medea (another famous sorceress) visited Circe on their way back from the Black Sea where Jason was looking for that dazzling piece of finery we call The Golden Fleece. 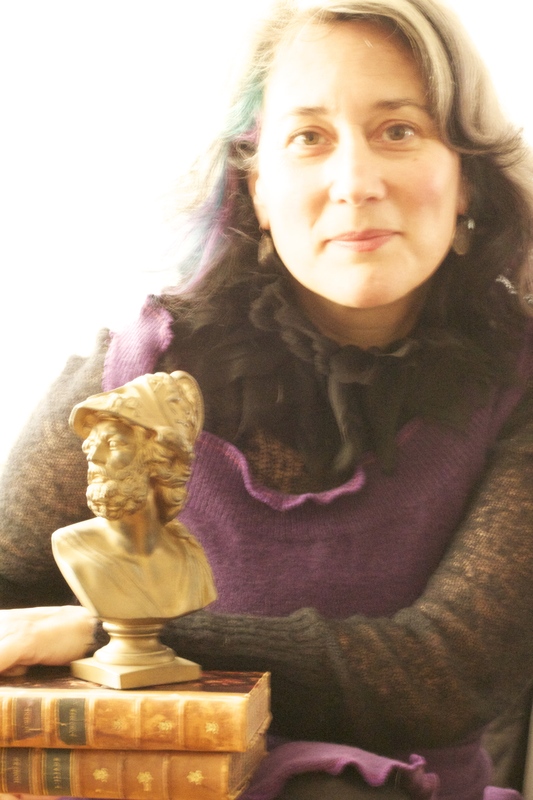 Medea worked all kinds of magic for the man she loved. She started killing people for his benefit quite early in their relationship. They stopped off to see Circe who purified them after they killed her brother. They washed up & got on their way. Later, Jason left Medea for a rich (and much younger) princess—so, Medea killed her in a very fiery, burning-flesh kind of way, and then hung up her little ones to dry, so to speak! She knew this would destroy Jason’s spirit! But that is a whole other story that I’d love to get into here, but hope that you will do a little research on your own and find out why Medea is not just famous, but infamous! And, as usual, I get away from myself. 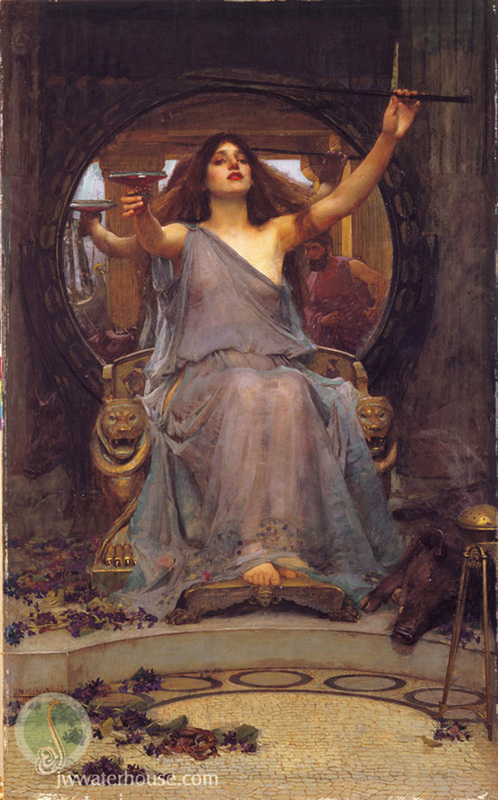 So here is the powerful Circe, who actually does no harm whatsoever to our hero and his companions. And indeed, makes them all taller and more handsome than before. Oh yes, and younger. Extra credit and a post here on the website to anyone who can paint, draw, or locate a fabulous image of Calypso. I have looked far & wide, but only found this one that just doesn’t do it for me. What fun you could have doing all the details of her magical garden. Or maybe someone could Photoshop this one & put some clothes on her! Enjoy today’s installment of The Odyssey! Posted in The Odyssey. 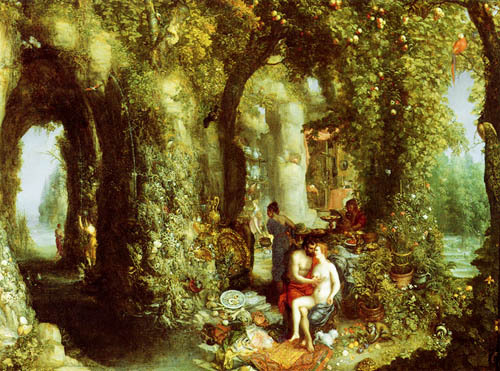 Tags: Ancient World Now, Calypso, Circe, Greek, Gwen Bowers, Gwen Minor, Homer, J.W.Waterhouse, Jason and the Argonauts, Medea, Odysseus, Read-Aloud-Plays:The Iliad The Odyssey and The Aeneid, The Black Sea, The Golden Fleece, The Odyssey. RSS feed for comments on this post.. TrackBack URL.